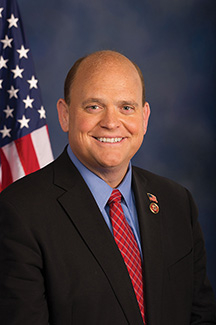 Republican Rep. Tom Reed may have voted to repeal and replace the Affordable Care Act, but with that effort now essentially dead, he's turning his attention to amending the landmark health law instead. Reed co-chairs the Problem Solvers Caucus along with Rep. Josh Gottheimer (D-N.J.). The 43-member bipartisan panel late last month issued a set of legislative goals for reforming the ACA. Reed is in his district in western New York listening to constituents during the August congressional recess. He spoke with Modern Healthcare reporter Mara Lee. The following is an edited transcript. Modern​ Healthcare:​ What​ are​ you​ hearing​ from​ constituents​ on​ fixes​ to​ Obamacare? Tom​ Reed:​ Many of them are very happy that someone has taken the initiative to try to stabilize the individual marketplace, and what we're proposing, to a large degree, they say is reasonable. Overall, people appreciate the fact that we're trying to govern and deal with the problem that we face in the individual marketplace. MH:​ So​ you're​ not​ hearing​ anger​ from​ voters​ that​ the​ Senate​ did​ not​ repeal​ Obamacare? Reed:​ I think there is some frustration from our base. As I tell them, we moved a bill in the House, obviously, the Senate didn't (pass one). We're very practical people in upstate western New York. An incremental approach may be the way we have to proceed, and they're open to it. MH:​ You​ say​ spending​ and​ foregone​ revenue​ would​ have​ to​ be​ paid​ for.​ Are​ you​ making​ an​ exception​ for​ cost-sharing​ reductions,​ since​ the​ government​ has​ already​ been​ spending​ that​ money​ and​ so​ that​ does​ not​ increase​ the​ deficit? Reed:​ Yes. The cost-sharing payment score is zero, according to the Congressional Budget Office, but when you get to the employer mandate relief, you get to the medical-device repeal, (and $57.5 billion in state stabilization funds) the proposal is anywhere from $200 billion to $250 billion over 10 years. The offsets are primarily Medicare payment policy reforms, as an illustrative list, not a black and white list. There's a credible way to make sure that this is paid for, and we recognize that there is significant cost to what we're doing. MH:​ What​ Medicare​ reform​ proposals​ are​ you​ talking​ about? Reed:​ Promoting generics in federal medical programs, the bundled-payment proposals are on there, to try to continue that transformation of reimbursement policies to reward quality and value, rather than just fee for service. . . . the bad-debt proposal that can be dialed, in order to generate some savings. MH:​ Have​ you​ heard​ from​ any​ doctors​ or​ hospitals​ since​ you've​ been​ back​ in​ the​ district​ on​ these​ ideas? Reed:​ Any time we get into reimbursement-type decisions, obviously, there's a lot of concern, but I believe they do appreciate the fact that we're trying to do something and not just get bogged down in the gridlock, not get stuck in the us-versus-them type of mentality that has led us to where we are today. MH:​ What​ revisions​ to​ 1332​ waiver​ guidance​ would​ be​ helpful​ in​ your​ view? Reed: When it comes to 1332, that is the ability of states to apply for a waiver, one of the regulatory reforms that I see is not having to go through state legislatures in order to get to the finish line, but just have the governors and the insurance commissioners be in a position to make the application. MH:​ If​ the​ full​ Senate​ passes​ a​ bill​ funding​ CSRs​ and​ making​ tweaks​ to​ the​ 1332​ process,​ do​ you​ think​ the​ House​ would​ follow​ within​ a​ month​ or​ two? Reed:​ Once the Senate acts, then immediately, you're going to see a tremendous amount of pressure on the House to strongly consider that legislation as soon as possible. MH:​ What​ resistance​ have​ you​ and​ other​ Problem​ Solvers​ Caucus​ members​ gotten​ to​ this​ effort? Reed: They've been ridiculed; they've been attacked; they've been threatened. The ones that are opposed to this type of incremental approach want to maintain this kind of division.